Are you ready to change your body for life? Do you want to step on a scale and feel happy? Do you want to look in the mirror and feel proud? Do you want looser-fitting clothes? Do you want more energy? Do you want to sleep solidly through the night? No games. No gimmicks. No shakes. No starvation. Just a straightforward and simple, doctor-approved approach to eating and exercise that throws out decades of bad science and will transform you from being a fat-storing person into a permanent FAT-BURNING MACHINE. This is our promise: Follow this plan and you will experience dramatic, life-altering results. - Have you been gaining a pound or so a year, for the past few years? - Do you crave sugar and snacks, and worry that you can't control your cravings? - Do you feel that the more you exercise, the hungrier you are and the more you eat? - Does exercise make you feel tired and weak? - Are you working out more than ever and still gaining weight? If you answered yes to any of these questions, then it's time to find out if the habits you've developed are causing your body to store fat or to burn it. So much of what you've been taught about fitness and weight loss is patently false--that you have to eliminate all fat from your diet or that you should load up on carbohydrates before a workout. These practices may actually be sabotaging your success. 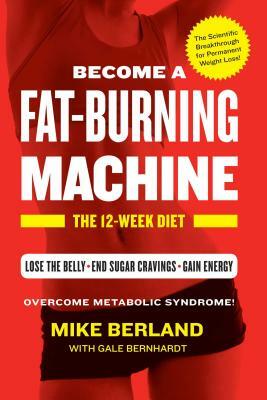 Fat-Burning Machine exposes the myths that have prevented you from achieving your weight and fitness goals, and will revolutionize the way you think about your body, your health, and your outlook on life. Mike Berland is the CEO of Edelman Berland, the strategic research and analytics arm of Edelman. His clients have included multinational companies, professional sports leagues, entertainment figures, higher education and cultural institutions, and political leaders. After becoming a fat-burning machine, he experienced a dramatic reduction in weight (and has kept it off), and successfully completed his first New York City Marathon and the 2015 Ironman World Championships in Kona, HI. Gale Bernhardt is a two-time Olympic coach and leading athletic trainer. She was selected as one of Men's Fitness magazine's top six online trainers and is certified as a Level I Coach by USA Cycling and a Level III Coach by USA Triathlon. She has previously served on the USA Triathlon National Coaching Committee.